Positano…. Oh how I love Positano!! This was my first time visiting Positano and I want to go back. Immediately. If not sooner! 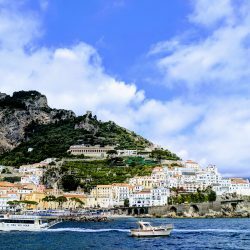 If you have to pick one place on the Amalfi coast… THIS IS IT! I don’t know what it is about this place but I was immediately enthralled and doing boomerangs on the hillside to illustrate my joy! The vibe is laid back and relaxing. 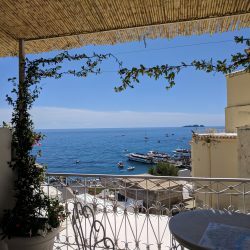 There isn’t much to do in Positano (unlike Capri – click here to read that review), so your ultimate goal here is to get some steps, take in the views and relax! We took the Ferry from Capri to Positano. It was 18.50 Euro per person and took 25 minutes. If you fly into Naples I suggest hiring a car to take you there. 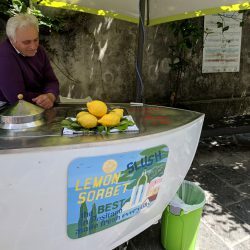 Its fast and cost less than 95 Euros (it cost us 95 from Praiano which is further) through Benvenuto Driver (click here to view their site). Alternatively you could take the bus but it will take FOREVER. Ain’t nobody got time for that! 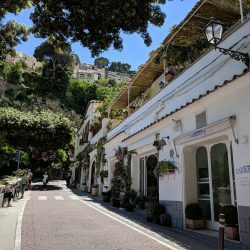 We stayed at La Tartana hotel which was a couple minute walk from the ferry dock. It is literally right next to the big church you see upon arrival. They have free Wifi (albeit slow) and free breakfast. The lemon croissants at breakfast were to die for (and I don’t even like lemon!). Oh my lord and the view from the room was UNREAL! We had a huge balcony overlooking the water and you could even see the view while laying in bed!! The location was amazing and I would definitely stay here again. That’s it! 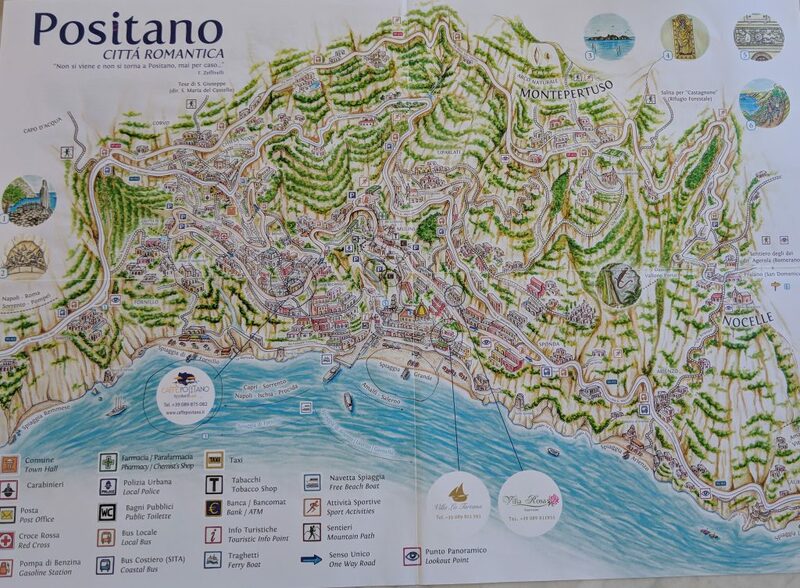 I am moving to Positano!! #1 Take the Bus! – it’s easier and cheaper than a cab. #4 Everything is discounted for locales. So if you’re wondering how these little old Italians afford to live on these expensive islands, just know that the cappucino that costs you 5 euro is only 1 Euro for them! #5 There is a Coperto (cover charge) to eat/drink almost everywhere. It is usually 1.50 Euro per person to sit and dine. #6 Water is not free when dining! And while Wine is not free either, its cheaper! So save water and drink wine! 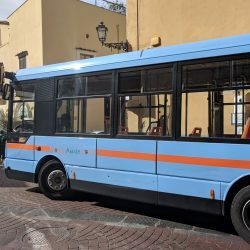 You can easily get around Positano utilizing the local bus! 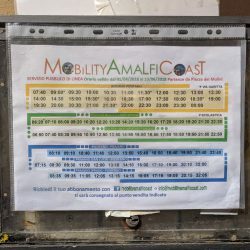 There is a bus that circulates internally throughout Positano and another that will take you to other surrounding areas (see photos of schedule below). 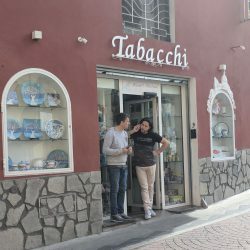 Just buy tickets at the local Tabacchi for 1.30 Euro and look for the sign that either says Interno (just around positano), Praiano or Nocelle. If you want to go to Sorrento or other areas on the Amalfi you have to hop on the SITA bus or take the ferry! 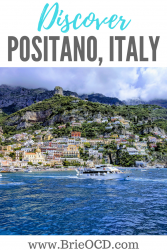 Click here to view the Positano Ferry Schedule. 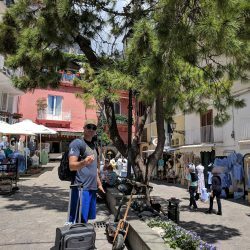 Needless to say it is super easy to get around the Amalfi Coast and even directionally challenged people like me were good to go! There is one club called Music on the Rocks in Positano that is in a cave and apparently pops off at night! However, it doesn’t open until 11:30pm so we didn’t go. Whomp whomp! Beer: Same as Capri there is a lot of Peroni and Nastro Azzuro lager everywhere. 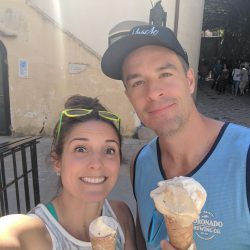 We drank more wine than beer in Italy but these were our two go-to’s when we were out and about or playing games in the hotel. Wine: Fantastico! The house wine does the trick every single time. It is the cheapest and still smooth and delicious. We also would go to the store and buy some bottles of Aglianico to play games on our hotel balcony. Coffee: I am not a strong coffee drinker so when I travel I usually stick with Cappuccinos and Lattes so that the milk tones down the strong espresso. They were consistent and delicious at the hotel breakfast and anytime we needed a pick me up. There are coffee shops all over the place so it isn’t hard to find a great cup of coffee. 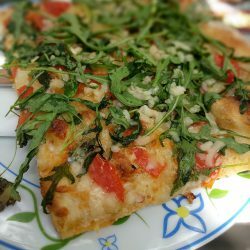 La Zagara – We stopped here initially to scope out all the goodies in the window but then we saw the pizza and decided to stay. It looked like a small bakery from the outside but on the inside it was big! It has a nice large outdoor patio that is cozy and has great Wifi. We both got a big square (slice) of pizza and 3 glasses of wine (total) for 28 Euro. Not too bad considering! 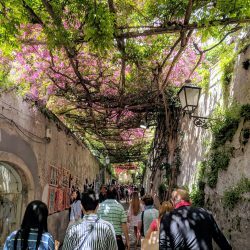 Casa Di Bottega – We found this place while taking a stroll (uphill, not so much stroll like) and it looked so dang cute! It was white and beachy and just looked clean and delicious. They are only open for breakfast/lunch and we had just eaten so unfortunately we didn’t get to try it. Next2 – We went here for dinner and it was very clean and hip. It may have been a wee bit too fancy for us but we made the best of it. They gave us a free appetizer and cookie plate. 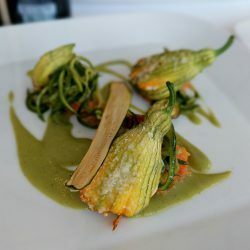 The only thing notable here were the squash blossoms. They were DELICIOUS. The rest was just ok, especially for 102 Euro. 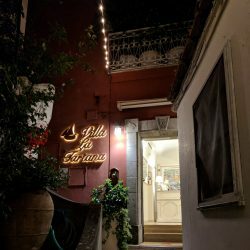 I would pass on this restaurant if I went to Positano again! Gelato – anywhere, everywhere, all day! HOT TIP: Buca di Bacco has gelato late night when all the other mom and pops are closed. 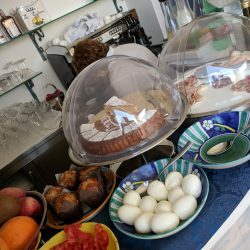 Vini e Panini – Market, Deli, Wine Shop! This little gem is right next to the church and has everything you need. It has toiletries, food to go, fresh produce, a deli and wine! 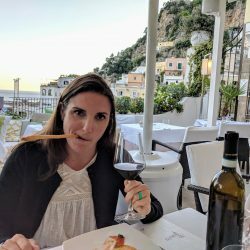 La Tagliata Restaurant– This place was recommended to me by 3 different people. In my opinion you go to La Tagliata for the experience and not for the food. I know I am going to receive backlash from that statement but I dare you to tell me that the food was AMAZING. This place definitely knows the value of the customer experience. They have a free shuttle from Positano to pick you up and take you home. All of the food is fresh from the farm. There don’t have a set menu because they bring you courses based on what was picked from the farm that day. Amazing and awesome concept. Views are unreal. Unlimited wine and water and a ton of food for 40 Euro per person. That is CHEAP for the Amalfi Coast my friends! The only downfall is that the food is just OK. The veggies were awesome and reminded me of my Grandma Vinny’s broccoli rabe. The pasta was also pretty darn tasty but the rest, meh. That being said, I would definitely come back here for the experience and ambiance. 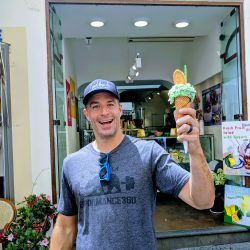 always say yes to gelato! Getting more Gelato & found Friars in Positano! 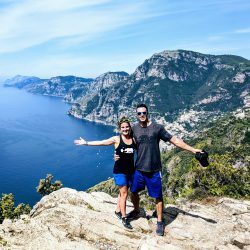 Sentiero Degli Dei – Hike of the Gods – This hike had the most incredible views of both Praiano and Positano. 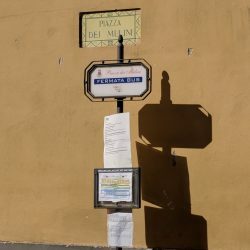 We took the bus from Piazza Dei Mulini in the heart of Positano up to Nocelle. From there we hiked from Nocelle to Boomerano. It took us 2 hours because we stopped to take photos. 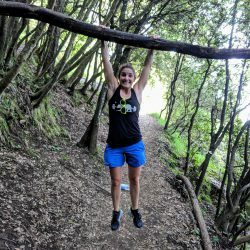 You do need to be in shape and have sturdy legs to hike this but it is so worth it! 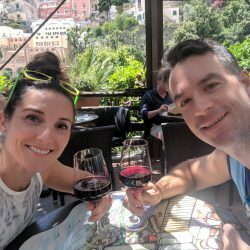 We decided that we didn’t want to hike back so we took the bus from Boomerano to Amalfi (you can’t get back to Positano from Boomerano). This was a nice surprise because we didn’t plan on seeing Amalfi. We got a beer, saw the church and headed back on the next ferry! 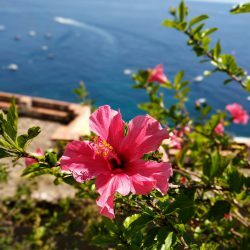 Day trip to Praiano – Take the 12 minute bus ride to Praiano for the day! (Click here to read my upcoming Praiano Review). 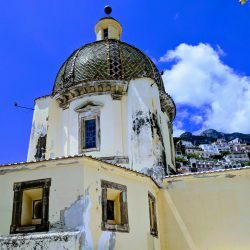 Day trip to Amalfi – Take the 8 euro ferry to Amalfi for the day and stroll the streets and check out the church. 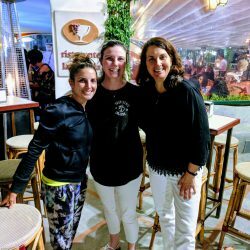 Cooking Class – take a cooking class while in Italy! Buca di Bacco has cooking classes daily at 3:30pm. Unfortunately we looked it up at 4:30 so we couldn’t do it. Next time I go to Italy this is going to be numero uno on my list! 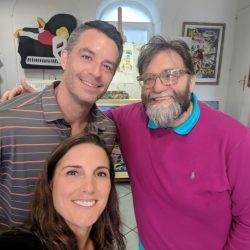 Art & Craft – Head over to Giancarlo’s Art Gallery to see some original paintings by Giancarlo and other local artists. Walk Around – Just walk and take in the Positano vibe. Browse the shops, stop for some wine and chill. Spiaggia Grande (Beach) – Rent a chair (20 Euro) right by the water or bring a towel and lay for free!